Occasionally, we get to test a product with the potential to transform the consumer landscape, to get us to start thinking about something in an entirely new way. The first 360-degree video cameras tried very hard to do this, but they ended up being little more than gimmicks (arguably, many still are today). Even as cameras like the Samsung Gear 360 have taken the format further by improving quality and features, immersive video still feels a bit like a party trick. GoPro’s new Fusion looked to change this, but the $ 600 360-degree action cam isn’t really meant for broad consumer applications. When Rylo entered the immersive video scene over a year ago, it was yet another startup looking to capitalize on the 360 trend. But cofounded by the person responsible for Instagram’s impressive Hyperlapse video stabilization, the company had knowledge and insight that would help its eponymous Rylo camera stand out from the crowd of mundane, copycat 360 cams. It may be the first immersive video camera to truly bring 360 to the mainstream, by using spherical video not to output a virtual reality experience, but rather to create more interesting fixed-frame videos — that is, standard rectangular content. Since we initially reviewed the Rylo, it has received new features, higher resolution recording, and even a desktop editing app. In April 2019, a major software update introduced a feature that had been on our wish list since launch: The ability to set key frames for zooming, which lets you smoothly zoom in or out within a clip. Given all its new capabilities, we felt it was necessary to take the Rylo for another spin. What we found was that, despite going on 2 years old, the Rylo is still the 360 camera to beat. A 360 cam that isn’t actually meant to deliver in 360? We know, it sounds crazy — but it may just be crazy enough to be genius. The Rylo records spherical video just like any other 360 cam. Users are free to share the full spherical video if they like, but the Rylo’s secret is its ability to allow you to “direct” the camera from within its app (Android, iOS, or MacOS) to output professional looking fixed-frame videos. Reframe, create automatic pans, track objects, speed up into time-lapse, or zoom in and out after the shot is made — all with perfectly smooth stabilization. In essence, the Rylo is a true set-it-and-forget-it camera, capturing everything around it and giving you the freedom to make creative decisions later. Sure, this is technically possible with any 360 cam and the right editing software, but never has it been so user friendly and approachable — and never have the results looked so good with so little input required. The Rylo can easily fit into the palm of your hand, although it’s not meant to be held that way. 360 video works best when you can get the camera away from your body, and fortunately Rylo includes an Everyday Case with the camera, which is essentially a mini selfie stick that helps get your fingers out of the way of the camera’s dual lenses. One day, a camera like this may replace all of your consumer video gear, from your action camera to your camcorder. The hardware interface is incredibly simple with just two buttons. One turns on the camera and starts and stops recording, the other switches between still and video modes. Next to the mode button is a small LCD that displays shooting information. There’s no monitor for framing your shot because, well, you don’t really need one. So long as there is a clear line of sight between the camera and your subject, it’s in frame. This may be a consumer camera, but it is a premium one and it looks and feels the part, with a solid aluminum frame. It is not ruggedized or weatherproof, but an optional Adventure Case is available for $ 69, which can attach to GoPro mounts. On the inside, twin sensors capture 5.8K spherical video (with the free firmware updated released on November 8, 2018) or 6K spherical photos. A 16-gigabyte MicroSD card is included — good for about 35 minutes of video — and cards up to 256GB are supported. Standard fixed-frame videos are output at Full HD 1080p resolution, although the number of real pixels that go into composing that image will depend on the angle of view you set when editing, since any “zooming” is digital. Since the camera is geared for a fully mobile workflow, Rylo has incorporated a technology that is both faster than Wi-Fi and easier to set up than Bluetooth for transferring footage to your phone. It’s called a USB cable. Plug it in, turn on the camera, and the app automatically launches. No passwords, no pairing, and no connection errors and associated headaches (but you do need to remember to bring the cable with you, as there is no wireless connectivity to fall back on). The Rylo mobile app (iOS version tested) serves up a beautifully simple user interface. If the camera is connected, you can browse video clips on the camera and tap the download button to import them. Clip length is limited to about 4.5 minutes (in the highest resolution, 5.8K mode), so if you record longer than that, the camera will split your footage into multiple clips. These longer clips may take a couple minutes to load, but once a clip is imported, you can begin editing your footage using a suite of intuitively designed controls. 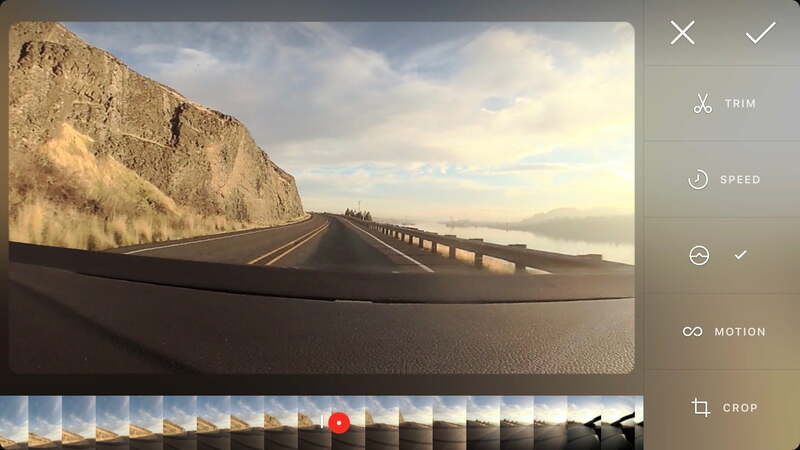 In truth, is far easier than we ever expected editing 360-degree content could be. The most essential of these is Points, which aims the camera in a chosen direction at a selected moment in the timeline. Since the April 2019 update, this is also how you can create smooth zooms. To add a point, simply pan around the 360-degree field until you have the framing you want, and press the “plus” icon. Optionally, you can pinch to zoom to set a preferred angle of view for the point. Zoom in to focus on a subject, or pull all the way back into little planet mode. You can then continue to play the video, or fast forward by scrubbing along the timeline, adding points along the way. Reframe, create automatic pans, or track objects after the shot is made. If there’s any issue with the feature, it’s simply that it can sometimes pan the wrong direction from what you want. Say you’d like to make a grand 270-degree sweep, so you drag the frame around 270 degrees and place a Point. Well guess what? When you play back the video, it will pan 90 degrees in the other direction. You can get around this by breaking up your pans into smaller segments, knowing that the app will always take the shortest distance between two points, but this may cause the final result to be less smooth than if the software handled the entire pan automatically. Being able to indicate a pan direction between two points would be nice. Alternately, you can have the software automatically follow an object always keeping it in the center of the frame regardless of how it, or the camera, moves. Simply press on the screen over the object you want to follow (using 3D Touch on supported iPhones; hold your finger down on other devices) and a circle will appear indicating where the app is tracking. In practice, we found Follow to work well so long as the camera always had an unimpeded view of the subject. If another object passes in front of it — or if you’re trying to follow, say, a person’s face and they turn around — the app might lose track. Luckily, playback stops when this happens and you can immediately set another Follow marker to pick up where it left off. The problem with this is that there will be a jump cut the new follow point. It would be nice if the Follow feature made use of the same automatic speed ramping and smoothing of the Points feature, in order to seamlessly connect multiple Follow commands. As of the April 2019 update, this issue has not been resolved. The FrontBack feature creates a picture-in-picture or side-by-side display of two different angles. Simply tap the FrontBack button to cycle through the display options. This could be great for vacation selfies, or for YouTube tutorial videos, or displaying two sides of a conversation at once. And while we don’t recommend trying it, this is also how you could show your reaction to crashing your mountain bike and your point of view of the crash at the same time. Introduced in the April 2019 update, the Speed modifies the previous time lapse tool so you can speed up select portions of a clip. You can still speed up the entire clip if you prefer, but the speed tool lets you get creative by speeding up different sections of a clip by different amounts — anywhere from 2x to 16x. You can set points and follow objects within the sped-up sequences, which gives you much to experiment with and lets you produce some pretty stunning time lapses. Unfortunately, the speed tool cannot be used for creating slow motion sequences. All of theses features are also available on the MacOS desktop app that was released in 2018. The app, which we tested previously in beta, ran well and offers an elegant, easy to understand interface. It makes some options more immediately accessible than the mobile app, but it also feels less intuitive to pan and scan using a mouse or trackpad rather than a touchscreen. The desktop app is free, so it’s certainly a nice option to have, but the mobile experience remains the key selling point. Digital Trends reached out to Rylo regarding a Windows version of the app and was told one was in the works, but a release date is still to be determined. As of April 2019, the MacOS version remains the sole option for desktop computers. All of the Rylo’s editing features wouldn’t be half as good if it wasn’t for the underlying stabilization technology. The system works thanks to a built-in gyroscope that measures movement and corrects for it in real time. In a way, this is no different than how Hyperlapse works, by analyzing the data from your phone’s accelerometer. The Rylo has evolved considerably since launch and remains one of the most competitive 360 cams on the market despite being well over a year old. However, the Rylo has a huge advantage over traditional electronic image stabilization thanks to its 360 degrees of coverage. Even very good EIS systems have to crop the image first before they can reframe it to compensate for camera shake. But by working within a spherical area, the Rylo’s software can reframe however it needs to without actually cropping. There’s no difference in resolution between having stabilization turned on or off. As an extreme test, we set the Rylo down on a potter’s wheel and turned it on. Even while spinning in full circles, the camera was able to stay focused on a single point. This particular setup isn’t really useful in the real world (unless you want to make a pottery video) but it helps illustrate how well the EIS system works. Stabilization also works for time lapse sequences, no surprise given Rylo’s Hyperlapse background. The camera also automatically levels the horizon, although you can adjust this manually (which you may need to do in certain circumstances, such as driving, as lateral acceleration can fool the camera as to what’s actually level). The Rylo hasn’t physically changed since it launched, yet it has evolved considerably and remains one of the most competitive 360 cams on the market despite being well over a year old. We’re a little disappointed that it isn’t ruggedized and that the Adventure Case costs extra, because this could easily be the future of action cameras. The image quality may not match the likes of the GoPro Hero7 Black, but the flexibility afforded by capturing a 360-degree view offers so much more in terms of creative opportunities. After shooting with the Rylo, it would be hard to go back to a regular action cam. Sure, Garmin may have done this first with the Virb 360, and GoPro’s Fusion offers better stitching and image quality for those willing to put in the time and effort, but both of those cameras are more expensive and can’t match the pure simplicity of Rylo’s software. Low-light performance is also not great, although this is certainly not unique to the Rylo. The Rylo’s other shortcomings can, unfortunately, be blamed on the physical limitations of current technology. Image quality, for example, is merely fine — colors are nice and vibrant, but true resolution is well below the theoretical limit Full HD 1080p. Even after the 5.8K update, which came out in 2018, we weren’t particularly impressed with the level of detail in the video. Resolution isn’t the real problem here; it’s compression. The footage is so heavily compressed that you’re just not getting much out of all those pixels. Details, particularly in shadows, can get very blocky. These things may not matter when you’re just watching the footage on your phone, but the lack of detail becomes very apparent when editing on the desktop app. As a dual-lens 360 camera, there is also a fairly prominent stitching line between the two hemispheres. It is certainly not the worst we’ve seen, and you may not even notice it in some situations, but it can be a problem in others. Because of this, you should still put some thought into how you angle the camera, keeping one of the lenses pointed at your subject. If important parts of the scene get caught between the two lenses, they will be marred by distortion. Low-light performance is also not great, although this is certainly not unique to the Rylo. Any small-sensor camera simply needs a lot of light to produce clean results. Outside in daylight, it’s no problem, but indoors or at night, there is plenty of noise. Dynamic range is another sore point, and while this is also inherent of all small sensors, it’s a bit worse off in the world of 360 video. With the camera mounted on a dashboard, we found it properly exposed for the outdoor-facing view, meaning everything inside the car was far too dark. Outside on a bright day, it exposed for the sky, causing the foreground to be too dark. The big issue here is that you may not even use the portion of the frame that is properly exposed — it might not be included in the final video at all. Rylo previously updated its app with a “tune” feature that lets you adjust exposure and contrast (to some extent) in post, but this can’t make up for simply not capturing the proper exposure in the first place. We’re glad to see the company responded so quickly to feedback and issued the update, but this may not be a problem that software alone can solve. 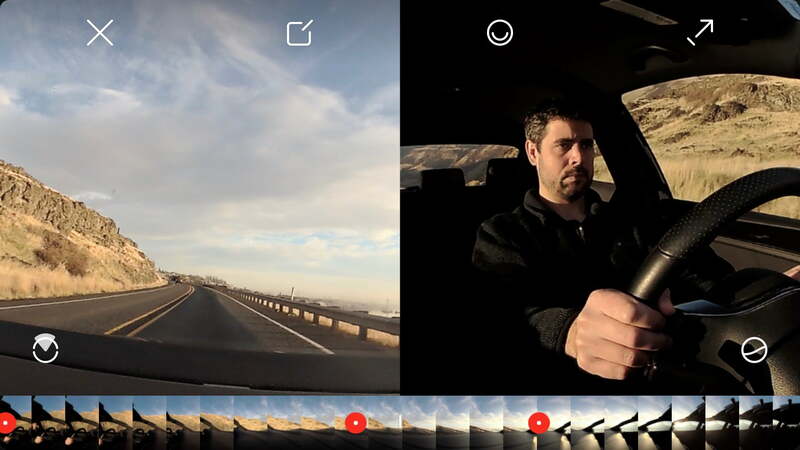 But as far as user friendliness is concerned, the Rylo app is the best mobile 360 video software we’ve ever used, and it keeps getting better. With the addition of speed and zoom tools, nearly all of our original complaints have been taken care of. The only thing remaining would be the ability to edit multiple clips together. The software includes some basic editing functions, like trim and crop, but that’s it. Fortunately, given the bevy of mobile video editing apps available, from iMovie to Adobe Premiere Rush, there are workarounds to this issue. But when you export a clip from Rylo to open it in another app, all of your 360-degree decisions are baked in and you won’t be able to change them without going back into Rylo and saving a new version of the clip. Maybe loading multiple 360 clips at once would put too much strain on the memory limits of today’s smartphones, but we hope Rylo can come up with a solution to this in the future. Rylo offers a one-year warranty. In 2017, we called the Giroptic iO (now no longer available) the best application of consumer 360 video tech we’d yet seen. The Rylo easily surpassed it. It doesn’t do absolutely everything (like live streaming, which was the iO’s trick) but it presents a very refined approach to what it does offer. It is truly a useful 360 cam, and one that is actually fun to use. After several rounds of major software updates, all of which were free, we are pleased to see that Rylo hasn’t stopped developing the software to bring new features and more value to customers. It may take another generation of hardware — and a technological leap in small sensor performance — before the Rylo can truly replace your action camera and camcorder, but there’s a glimmer of that future in the current product. The GoPro Fusion is the closest competitor, but it is more expensive and targets a somewhat different user. It has a far less intuitive mobile app experience, and while the desktop app can produce very high quality results, it requires a pretty extreme amount of processing power. Over a year in, and no real competitors have risen to take on the Rylo. Rylo continues to keep its camera fresh with firmware and app updates. Despite its age, we expect it still has a decent amount of life ahead of it. That said, 360 cameras are coming and going all the time as the industry continues to try to figure itself out. Rylo is well ahead of the game here in that it has a clear focus on what it wants to be (the non-360 360 camera) and how to do it. We say yes. The Rylo is still the most interesting and fun to use 360 camera we’ve tried. Like other 360 cams, it may still be somewhat of a party trick, but it’s a refined and elegant one that you’ll actually want to use more than once. Update: On April 9, 2019, Rylo released new firmware and versions of its apps that added zoom and speed tools, among other things. This review has been updated with our hands-on experience with these new features.